When first starting out in architecture, I felt that I needed direction. As I was about to enter this age-old profession, I did what a lot of would-be architects did and turned to people for counsel. I wanted to know how architecture fit into the larger scheme of things. Into the worlds of art and creativity and nature. So I turned to fundamental, foundational, books that dealt with core concepts of design, the design process or the secret language of nature. They were all also exactly 10.8 x 8.5 x 0.5 inch paperbacks and fit nicely together side by side on the shelf. Another was Herman Hertzberger’s ever-popular Lessons for Students in Architecture. Once I left school and entered the working world, I turned to books that addressed more of the specifics of day-to-day practice: how to find clients; how to treat clients; how to deal with difficult clients; how to get paid by said clients. But also: how to develop a design philosophy; how do you give a design critique. And, well, yes – what baking bread had to do with designing buildings. None were more valuable to me than the books written by Andrew Pressman. Andrew Pressman’s writing was always top-rate. His books were all extremely readable, entertaining and especially important in our field, accessible. His own design work as an architect was – compared with that of other architectural publications at the time – modest, in scale and budget. This was important. No one picked up a monograph of the work of Helmut Jahn and said I could do that, as in I could do that later this week. Reading Andrew Pressman’s books, you could imagine yourself going out on your own and doing what he did – designing, building what you designed, teaching and writing books. To some, that was the architectural quadrumvirate. 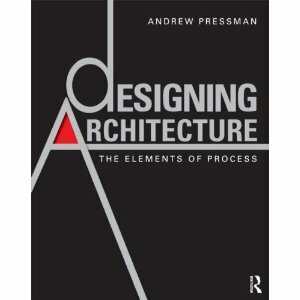 Andrew Pressman FAIA’s new book, Designing Architecture: The Elements of Process. Touted as much as a useful design tool as a book, Designing Architecture was written for both students and emerging architects who are starting out in formulating ideas, transforming them into buildings and interested in making more effective design decisions. Designing Architecture promotes both integrative and critical thinking in the preliminary design of buildings. The book itself is integrative in that it includes input from a number of sources – both present and past – as well as some from film and other media. The Foreward by Michael J. Crosbie PhD AIA is inspiring and thoughtful – setting the tone for the remainder of the book. Chapter 1, and introduction to the design process, opens with a relevant quote from the Woody Allen film, Annie Hall. And a bit later, in a section on strategies to inform preliminary design thinking, Pressman quotes at length dialog from what amounts to an architect-variation on a scene from A Few Good Men. What are considered to be strong architectural concepts and why? How is the design process like research? Chapter 2 immediately (and smartly) grounds the conversation about influences and inspiration in the world and thinking of the client and other stakeholders. This is where Pressman is strongest and most impactful – where he balances the practical with the aspirational. The content in this chapter is a perfect example of this effect. Chapter 3 is where you, the reader and designer, put it all together. Aptly entitled “Doing design,” this portion of the book contains useful design tips, mistakes to avoid, and addresses tools at the architect’s disposal – from pen, ink and marker to physical models, to building information modeling (BIM) software. On this last tool, the in-depth sidebar written by Autodesk’s Phil Bernstein and Joy Stark, profiling the digital design work of Case Design Inc, is a stand-out of the book. This chapter also delves into the subject of building systems integration and quotes from one of my favorite books on the subject, Integrated Buildings: The Systems Basis of Architecture. This section alone is worth the price of the book – and given how affordable Designing Architecture is – and a whole lot more. The last section, containing the case studies, at first feels light in terms of content, until you really dig into the cases. One of the case studies, for example, is of Autodesk’s HQ. I featured the same project in my own book and found that I still learned a great deal in the way Pressman went about describing the project from a design standpoint. All-in-all, I highly recommend Designing Architecture: The Elements of Process by Andrew Pressman FAIA, no matter where one finds oneself in their career. Principal of his own firm since 1983, Andrew Pressman FAIA, Architect, and Professor Emeritus at the University of New Mexico, he received a MDesS from Harvard University Graduate School of Design and currently teaches Professional Practice at the University of Maryland where he’s been since 2009.